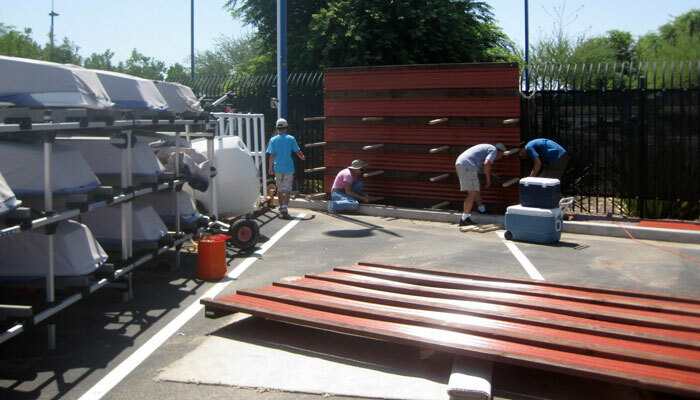 The work party builds storage units at Tempe Town Lake. A flock of workers have helped George Tingom and ASF fix, rearrange, cleanup and re-construct the storage area at Tempe Town Lake. Bruce Andress hauled off the heavy steel storage box. A crew built a storage rack for the new O’Pen Bic junior sports boats and took it to the lake. Then another crew built a new sail storage box, cleaned up and improved the racks in the trailer, and hauled off extra racks for storage in George’s backyard. The Saturday work crew: J.M. Kiel, Gail Kiel, Martin Lorch, Cedric Lorch, Mark Howell, Bruce Andress, David Cummings, Phil Freedman, George Tingom. The O’Pen Bic rack builders: Don Hubele, Phil Freedman, Dennis Davis, Wilson Davis, Chris Tingom, and Emory Heisler. 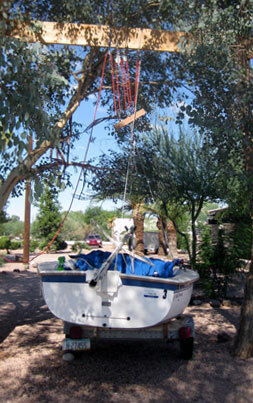 This homemade boat lift helps free up boat trailers for repair without taking 4-5 people to lift the boats. Big Kids Like to Play Too!